Large cooking area for a portable grill. With just one burner, cannot do indirect cooking. 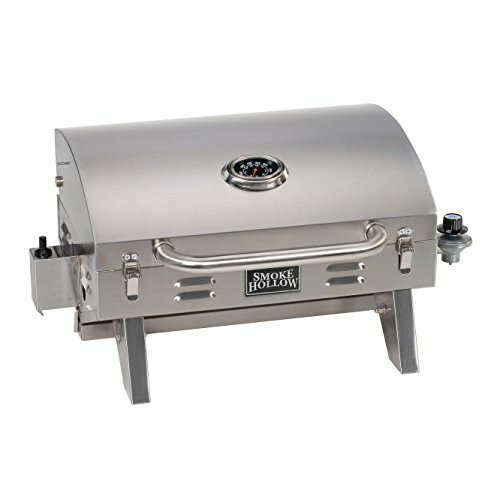 Overall, the Smokey Mountain Tabletop Grill is a good fit for grilling on the go. While there are some customer complaints, it has a decent customer review rating. The Smoke Hollow 205 Stainless Steel Tabletop LP Gas Grill is made for grillers on the go. It should work well for camping, tailgating, picnics and other outdoor activity. It uses small, one pound gas cylinders which are not included but are widely available. You can use a bigger cylinder by purchasing a tank adapter. It is made of long lasting stainless steel, has folding legs and a lock down top. 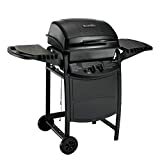 It has a generous 305 square inch grilling area at heats at 12,500 BTU which is about normal for a single burner grill.